With extreme weather in 2012 and 2013 many farmers and consultants are scratching their heads trying figure out what in the world to do for applying nitrogen for the 2014 corn crop. While soil testing in the fall is standard procedure for other nutrients, normal soil sampling and testing does not document the nitrogen available to corn. In dry years some nitrogen can carryover in the soil from fall to spring, but wet years have high levels of nitrogen loss. Nitrogen from manure and plowing down haylage are not available as quickly as nitrogen fertilizer. 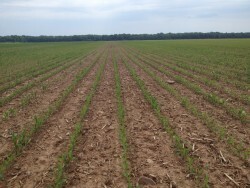 Normally a corn crop does not need any nitrogen beyond a small amount of starter in the first year plowing down a haylage field. Dairies can often meet their nitrogen needs with manure. However many corn fields after haylage or with lots of manure needed side-dress nitrogen in 2013 due to excessively high rainfall. Because of all these reasons the soil tests for nitrogen usually have different procedures than normal soil testing. Depending on the growing season some soil tests may be more useful than others, and other tools may be needed in addition to or in place of soil testing. Download this PDF for the full article that appeared in the May 2014 Ag Focus Newsletter.